Good Bye Lenin Hostel - Pub & Garden! v Krakov, Polsko: Zarezervujte nyní! Between Old Town and Jewish Quarter (Kazimierz) you can find a place which shows you the absurdity of communism times in Poland ‘through colorful and optimistic glasses’. A place where you have an opportunity to touch (quite literally) some characteristic elements of those bizzare years, which will make your eyes open wide and make you laugh reminding or realizing them. 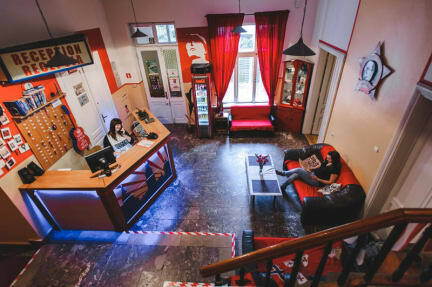 Good Bye Lenin will offer you rooms stylized on past decade, bar with Lenin touch and garden where you can chill after sightseeing or get some cheap drinks before heading to clubs. If you are interested in going to Auschwitz, Wieliczka Salt Mine or sightseeing in this amazing city - our laid back staff will help you with everythin because we are here for you! This is a place that lets the positive energy flow and create – good talk, great fun and lasting friendships. This place is for all who know that it is the people that make the journey. This is also what we believe in, which is why we invite you to stay with us while in Krakow and make your journey absolutely amazing!